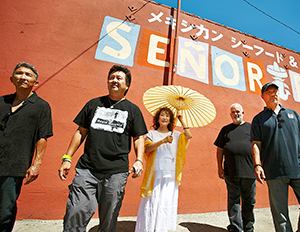 When Dan and June Kuramoto founded Hiroshima with drummer/percussionist Danny Yamamoto in 1974, they chose their band’s name not only to promote their cross cultural, Asian American musical vision, but also as a reminder of the human struggle and our collective ability to rise phoenix like from the ashes of the toughest life circumstances. 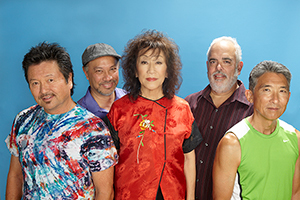 The concept has proven prophetic, as the ensemble—whose music has long blended pop, jazz, R&B and Latin influences with exotic strains of their Japanese heritage courtesy of June’s masterful koto playing—has endured over 35 years through the music industry’s many ups and downs. Since galvanizing the instrumental music world with its unique East meets West approach in the late 70s, Hiroshima has always kept its eye on a distinctive One World philosophy which seamlessly blends Asian and North American culture to reflect both cultural and spiritual connections. Their 1979 self titled debut was on Arista, and their song “Winds of Change” received a 1981 Grammy nomination for Best R&B Performance. Their five 1980s recordings with Epic included Another Place, which spawned the hit single “One Wish” and earned them a gold record, and Go, which topped Billboard’s contemporary jazz charts for three months. In the Nineties, Hiroshima bounced from Qwest to Warner Jazz to Windham Hill, and after a several album stint with Heads Up in the 2000s, they have released their last two albums, Departure (2011) and new album J-Town Beat on their own independent label, Hiroshima, Inc. Hiroshima received their second Grammy nomination in 2010 for Best Pop Instrumental Album for Legacy. JazzMonthly recently interviewed band co-founder Dan Kuramoto, who plays saxophones, flutes (including the shakuhachi on the new album), keyboards and percussion. JazzMonthly: Next year will mark an incredible 40 years since Hiroshima began. The core of you, June and Danny has endured, with a lot of great rotating players through the years. How do you explain the longevity? Could you have imagined you when you started that you would be together this long and still going strong? DK: Of course, we never had a notion about how long we would do this, because the most important thing for us was simply that we were doing it. When we started there were no real Asian American or Japanese voices in Western music. The whole genesis of the group was to create that voice, featuring June’s koto as a centerpiece. She brought a powerful personal story into the mix, moving from Japan to L.A. at age six, not speaking any English and feeling disconnected with the world around her. She started playing the koto right about that time. There was this confluence of pop, jazz/fusion and Latin with her very classical sounding vibe. When Hiroshima started, the rest of us were really connected with her vision. I had to drop out of UCLA’s cinematography program and became a 21 year old professor and first department chair of Asian American Studies at Cal State Long Beach. So the idea of making music that had the Asian influence was exciting to me. Based on June’s passion, Danny, I and Dean Cortez, who later became a full time member, all became excited about making music that was familiar but whose mix would always include a lot of multi-cultural surprises. Everyone felt it was an opportunity to do something unique and intriguing, to explore so many different things, and we still feel the same way today. JM: How did the band originally form? What was your goal at the time musically and career wise and how did you go about achieving that? DK: I fell into doing music for documentaries with Visual Communications, the first Asian American film company. So I started to find local players who could relate to the music I was writing. One of those was Danny, who was studying ethnomusicology at UCLA and had placed second in a battle of the bands in high school playing with Billy Childs! We got hired to do a single performance of a musical in Downtown LA based on the ancient Chinese fable called “The Monkey King.” I brought in some incredible jazz musicians and we had the opportunity after the show to play several original songs. The centerpiece of this musical experience was June. Realizing that there was a definite vibe there, I asked some of those musicians to start a garage style band and we began renting spaces that we got thrown out of because they weren’t designed for music. From there we tried to evolve our sound – and trying to figure out how to do that is the same thing that drives us today. JM: Stylistically, how close is the music you made at the start to the music you are making now? DK: The through line is June and her koto, the sound of it and her approach to playing it – that’s the key to the reason we have survived this long. People identify us with that sound, and it doesn’t hurt that legends like Stanley Clarke have called June the world’s greatest koto player. Her style is unique because she is taking a traditional Japanese court instrument and making it public, creating a dialogue with our instruments of different cultures to create new music around it. I generally do most of the writing and I like to mix pop-jazz fusion and Latin, which pays homage to my roots in East LA. June also brings R&B influences to the mix, and all of these things have come together in different ways over the years. The mix for us is not a blend, however. We’re not into the great blend thing, we’re more into diversity. All cultures have a richness and we should maintain them. Our new album J-Town Beat takes everything back to L.A.’s Little Tokyo, aka Japan Town, which to us is a microcosm of what is coolest about America. These little enclaves devoted to different cultures is what makes the world go round for us. They make life exciting and are the key to getting along better. It’s by digging the fact that we are different that things can really be cool. My driving force as a producer has always been keeping that perspective. J-Town Beat for us is a focused effort to explore that in a tangible way for the band we are right now. JM: It’s interesting that while the band started in 1974, you didn’t release your self-titled debut album on Arista till 1979. Why did it take so long to get a recording deal? How did that eventually happen? DK: It was utterly unlikely that we would ever get a record deal. We just wanted to see how far we could take this and see if it could be viable on other levels like scoring and doing live music events. We never thought we could become part of the mainstream American music scene. Like I said, we thought we could simply offer a perspective on things that were uniquely Japanese American. Through the CETA Program, the Comprehensive Employment and Training Act, we hooked up to play at Brockman Galleries in the Crenshaw Area, and played everything from Jewish community centers to schools in Watts. We were also the first Asian American act to play the Watts Towers Jazz Festival. Wayne Henderson of The Crusaders heard us and set up a series of showcases and thought he could help us get a record deal, which floored us. A lot of labels were interested, but Larkin Arnold, the new VP of Arista, was most excited. He was looking to diversify American music on their label. Clive Davis heard us and didn’t really connect with us, but he let Larkin sign us. Behind the scenes, people were telling Larkin he was crazy, that we would be lucky to sell 25,000 units. In our first three months, we sold 120,000 units and were chosen by Billboard and Cashbox not just as jazz group of the year, but group of the year in general. We surprised everyone! We later followed Larkin to CBS Records. JM: What are the advantages and disadvantages of self releasing? How is the new album J-Town Beat being distributed? DK: We’re doing all the traditional online routes, from iTunes, and CD Baby and are actually selling a lot of physical product on Amazon. Also through our website, WWW.HIROSHIMAMUSIC.COM. Our website also has my notes on all of the songs on the album. You learn a lot about marketing this way. The main advantage to me is that I can write the songs I want to write and we can record the songs we want to record, without any interference or corporate red tape regarding musicians contracts. That was a very difficult part of recording for labels. We could never have recorded a track the album opener “Red Buddha” in the past because it violates the formulas, mixing ancient Japanese elements, including kabuki shouting, with electronic drums and a pop groove. Big labels always insisted that we make our first four songs potential radio singles. When we put June’s beautiful song “Have You Ever Wondered” on Departure, that was our own way of protesting that mentality. Every song of J-Town Beat has a cool story behind it, but the overall concept is a tongue and cheek look at the disconnect between Japanese American and Japanese society. This is especially illuminated in the track “Meiji Mambo,” about the way some Japanese people regard us Sansei. We are adventurers so we found a different way to add this perspective. Another cool thing about running our own label is the ability to create and market side projects. We just started a cool series of recordings called The Sessions, where we will bring in an artist, who will do one of our songs, one of his or her songs and then a third on. Our first artist was the extraordinary singer/percussionist Vinx. These will eventually be available on our site and other outlets. JM: “J-Town” is the nickname of Los Angeles’ Little Tokyo. Tell me about that place and what it means to you personally? How does the music on the new album reflect the spirit of the place? DK: I grew up there, and the Union Bank there was near my dad’s Texaco station. We were an East LA family that would walk or drive over the bridge to work at the station. My dad used to build race cars there. During that time, J-Town was flourishing as a Japanese American center and dad had the only service station. My brothers and I pumped gas and did lube jobs when we were kids. To me, the place has always had a richness of multi cultural experiences, with streetcars and busses passing with people speaking Japanese and Spanish. There was an amazing energy and vibrancy that inspired the multi-ethnic approach I take to every project, especially J-Town Beat.